The 60 Plus Association, a group that's funded by conservative mega-donors the Koch brothers and other oil and gas interests, is the target of a watchdog complaint for failing to report political spending to the IRS. A campaign finance watchdog has filed a complaint with the Internal Revenue Service against the 60 Plus Association, a 501(c)(4) "social welfare" nonprofit based in Virginia that promotes a pro-business agenda. The group is one of several in the billionaire Koch brothers' conservative advocacy network that are spending heavily in North Carolina to defeat U.S. Sen. Kay Hagan, a moderate Democrat being challenged by Republican state House Speaker Thom Tillis. The complaint filed by Citizens for Responsibility and Ethics in Washington (CREW) charges that 60 Plus and its president, Amy Noone Frederick, violated federal law by failing to disclose more than $11 million spent on political activity in 2010 and 2012. "Out of one side of its mouth, the group told the Federal Election Commission it spent millions on political advertisements explicitly urging votes for or against candidates, and out of the other side of its mouth it told the IRS it spent almost nothing on political campaigns," said CREW Executive Director Melanie Sloan. In reports Ms. Frederick signed under penalty of perjury, 60 Plus told the FEC it spent $6,719,111 on independent expenditures in 2010, and another $4,615,957 on independent expenditures in 2012. Most of these funds were spent on producing and airing television advertisements advocating for the election of Mitt Romney for president or the defeat of Democratic candidates for Congress. Despite the FEC reports and the content of the ads, the group's IRS tax returns omitted almost all of this political spending. 60 Plus's initial tax filing with the IRS for the period covering the 2010 election claimed it spent $7,238,845 on political activity. A year-and-a-half later, however, the group amended their return to claim it spent only $103,136 on political activity during this period. Its tax return covering the 2012 election disclosed even less political spending -- just $35,000. Ms. Frederick signed each form, including the revisions, under penalty of perjury. Sloan said it "appears to be an open-and-shut case of intentionally lying on tax returns." Willfully filing a tax return containing false information is a felony. 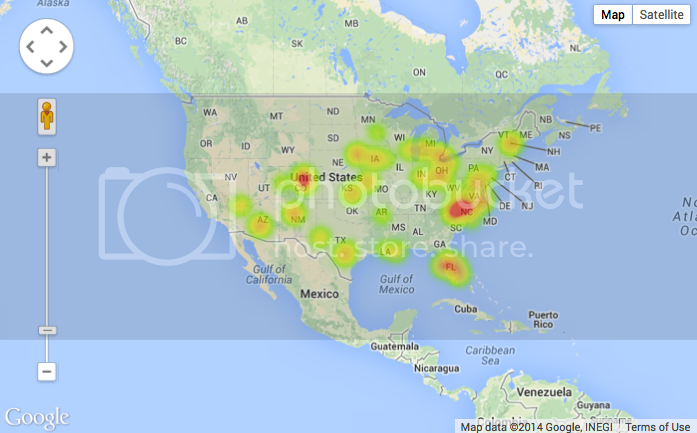 60 Plus was founded in 1992 as a conservative alternative to the American Association of Retired Persons (AARP). Its chair is James L. Martin, a Kentucky native and University of Florida graduate who previously worked with the National Conservative Political Action Committee and the anti-union Public Service Research Council. Noone Frederick, the executive director, previously worked as a political consultant and is married to Jeff Frederick, a former Virginia state lawmaker and former chair of Virginia's Republican Party. The group's national spokesperson is pop singer and actor Pat Boone. As a 501(c)(4) tax-exempt organization, 60 Plus is not required to and does not disclose the sources of its funding. However, the Center for Responsive Politics (CRP) has identified some of the group's major supporters through the IRS filings of its contributors. Between 2009 and 2012, 60 Plus received at least $41 million from groups tied to conservative mega-donors Charles and David Koch of the Kansas-based Koch Industries oil and chemical conglomerate. That includes nearly $16.7 million from the Center to Protect Patient Rights, now called American Encore; more than $15.6 million from Freedom Partners Chamber of Commerce; nearly $4.6 million from the American Future Fund; and $4.1 million from the TC4 Trust, which is no longer active. The 60 Plus Association has also received hundreds of thousands of dollars in support from the American Petroleum Institute, the leading lobby group of the U.S. oil and gas industry, according to CRP. 60 Plus is a member of the Cooler Heads Coalition, a network of climate change denial groups that is managed and financed by the Competitive Enterprise Institute and that includes Americans for Prosperity and the American Legislative Exchange Council, all of which are supported by the Kochs. The Cooler Heads Coalition has been described as an "astroturf group" funded by industries opposed to carbon regulation. North Carolina is currently embroiled in political controversies over fracking, offshore drilling, and climate change-related sea-level rise. The 60 Plus ads targeting Hagan criticize her and other members of the Senate Banking Committee for sponsoring bipartisan legislation to restructure the housing finance market and replace Fannie Mae and Freddie Mac -- publicly traded, government-sponsored enterprises that buy home loans from lenders and sell them to investors -- with the Federal Mortgage Insurance Corp. The FMIC would function like the Federal Deposit Insurance Corp. by guaranteeing mortgages but requiring the first 10 percent of losses to be absorbed by private capital. 60 Plus claims this would "allow the government to take over the mortgage industry in an action 'disturbingly similar' to Obamacare." Factcheck.org concluded the claim stretches the Obamacare analogy "to absurd lengths" -- particularly since the legislation would actually reduce the government's role in the mortgage market. The 60 Plus Association and other Koch-connected outside spending groups -- American Commitment, American Energy Alliance, American Future Fund, Americans for Prosperity, Concerned Veterans for America, Freedom Partners, Generation Opportunity, and The Libre Initiative -- bought advertising time on at least 106 different TV stations nationwide during the 2014 election cycle through July 10, according to an analysis by the Sunlight Foundation. The Koch-connected groups are spending most heavily in North Carolina. 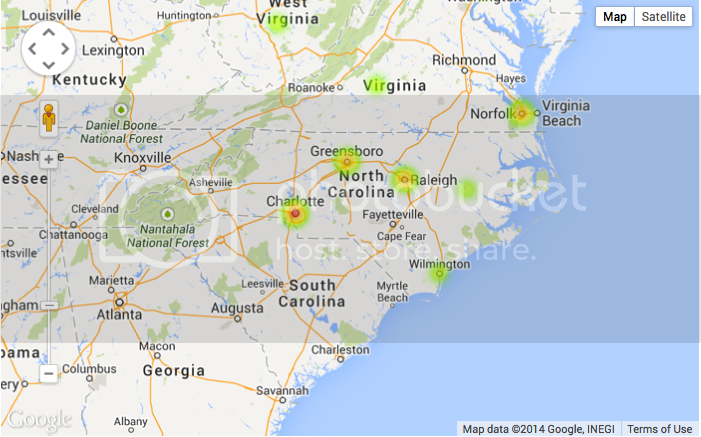 As of last month, 60 Plus had purchased ads on four stations in the Charlotte media market, North Carolina's most expensive; three stations in the Greensboro market; one station in the Greenville market; and four stations in the Raleigh market, the Sunlight Foundation reports. 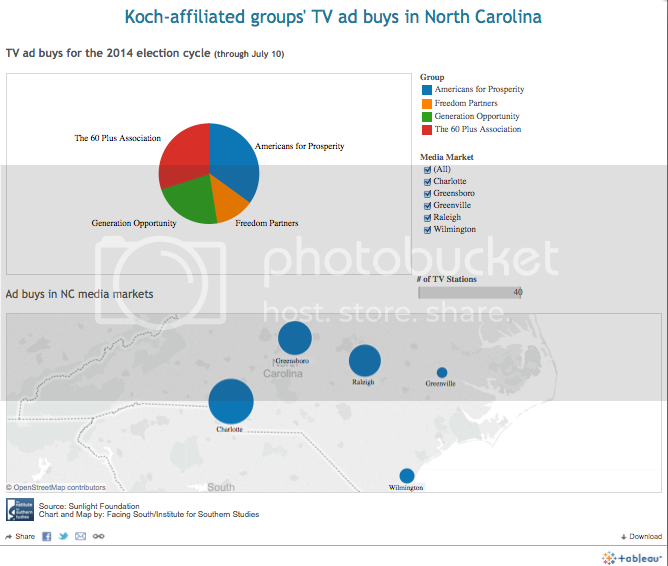 Three other Koch-connected groups -- Americans for Prosperity, Freedom Partners, and Generation Opportunity -- have also bought ads in North Carolina during this election cycle. 60 Plus is the second-biggest spender among the Koch-connected groups in North Carolina after Americans for Prosperity.